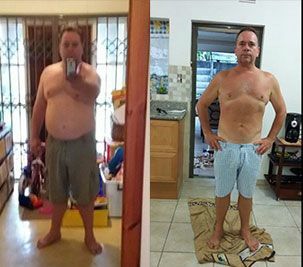 Before I started Banting I weighed in at 130kgs was on IR medication but gyming like a dog. size 42 pants and XXl shirts. Then I heard about it from my mother in law bought me the book and it lay in the bookcase for a year. I spoke to some people on Banting and did some research on line and started following the groups on Facebook in particular Christine in Australia. There was no major change in eating habits as we were generally eating fresh veg and so on but also carbs and sugar. Took the plunge in October 2014 and lost 15 kgs in the first month and another 17 kgs from December 2014 to March 2014. Since march I have remained at 98 kg’s but have felt my size reducing so not stressed about the weight but now is about the health. I am now wearing a size 34 and L shirts. My final comment on Banting is that it is a no brainer. We eat good healthy food with extra fat and are never hungry. Whoever wants to listen to me I promote it due to my belief that this is a benefit to my health. Try as best we can with our 4 year old but it does have its challenges. My wife has gone from size 12 to size 8 and lost around 15 kgs. Naturally my IR medication has stopped and blood pressure back to normal.